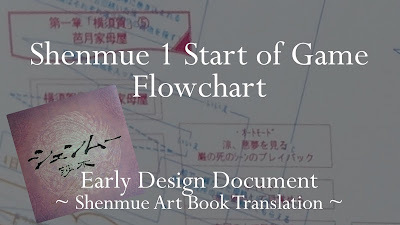 Several snippets of actual early design documents from the making of the first two games are contained in the 1998 Shenmue art book, in a section entitled "Making of Shenmue". Today we tackle another flowchart, which is from the opening gameplay of the first game. Some interesting differences can be noted compared to the release version of the game. 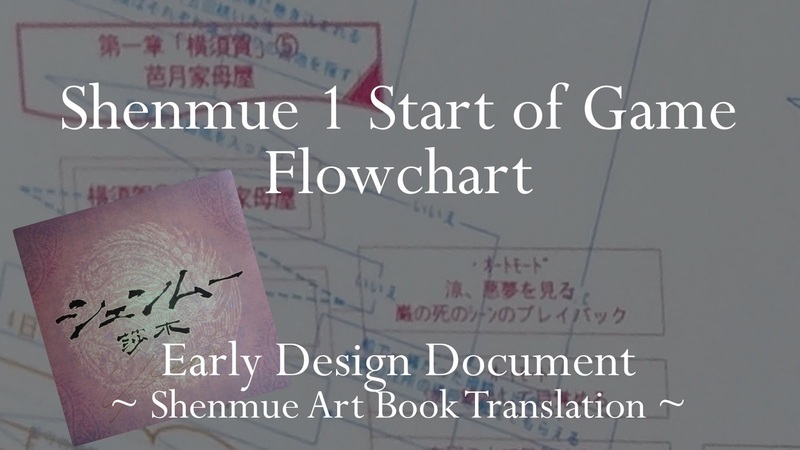 In the Shenmue art book, portions of several different design diagrams have been overlaid on a single page for artistic effect, making deciphering them a challenge, although at least each is printed in a different color. The flowchart relating to Shenmue 1 is reproduced at an angle on the page in a magenta shade, in the area highlighted below. 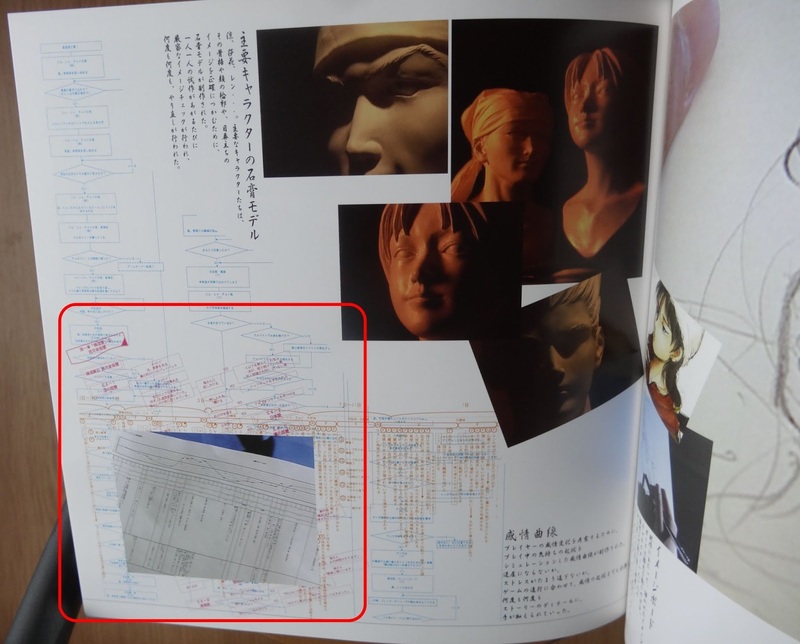 The Shenmue 1 flowchart is the magenta-colored diagram inside the highlighted area on this page of the Shenmue art book. Image credit: David De Ville. 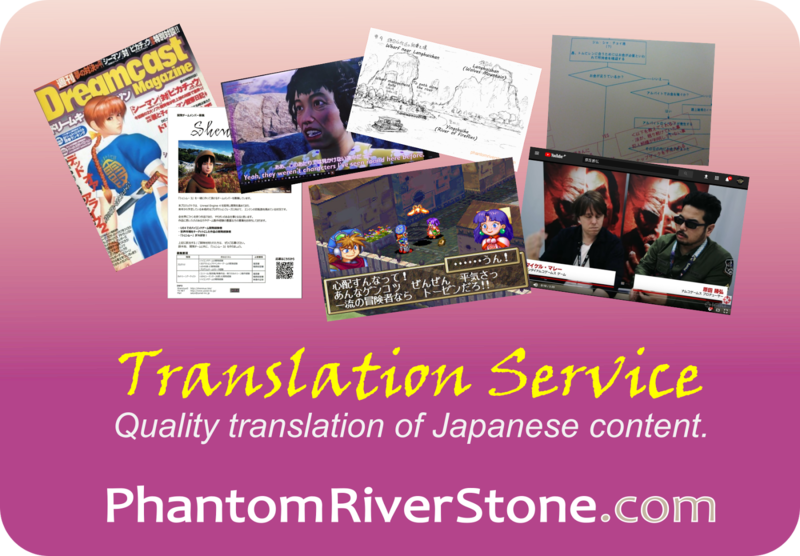 Since the diagram is of course in Japanese, the first task was to translate it into English. Here is an overview of the translated version. I've divided it into three parts for easier readability and discussion, so we'll look at each of these in turn next. Here is the first part of the diagram, which identifies it as being for Shenmue 1 (with its Japanese title "Shenmue Chapter One: Yokosuka"), in the area of the Hazuki Residence and more specifically in Ryo's room. The start of the flowchart. (There is an apparent discrepancy between the area ID in the main heading which has "5" and the rest of the diagram which has "4"). The events described can be recognized as the first to occur once the game proper begins after the prologue, with a label "Automode" indicating a cut scene. 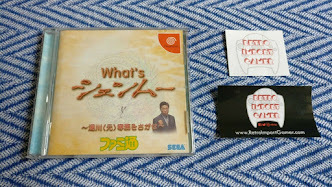 The note in the last box is of particular interest as there are some differences compared to the released game. It states that Ryo has been in a coma for a whole week, and Fuku-san has been the one looking after him. 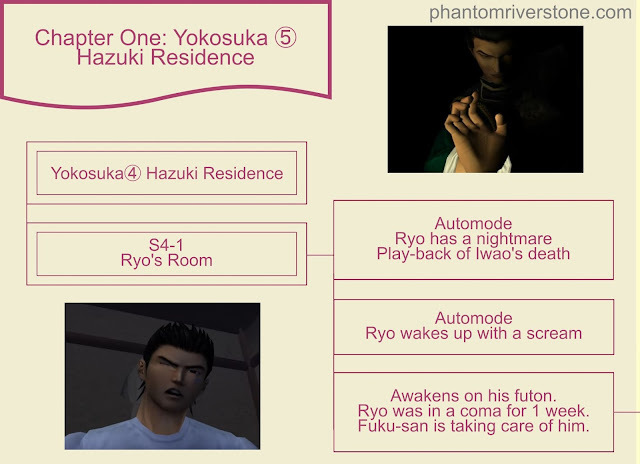 Whereas in the finished game, the story begins on the morning of the 4th day after Iwao's death; and there is no indication that Ryo has been incapacitated to such an extent. And as we know, Ine-san is the one who has been looking after both Ryo and Fuku-san. I wonder whether, at the point this document was made, the character of Ine-san had yet to be created and the idea was that Iwao's untimely death left Ryo and Fuku-san on their own. The traumatic impact of his father's death on Ryo was also originally even greater, with him being rendered unconscious for several days. The next part of the diagram outlines of the actions that Ryo can take immediately after awakening. The second section of the flowchart (click to enlarge). If Ryo seeks out Fuku-san, he fills Ryo in on what has happened over the past week, including the fact that there has been no progress in tracking down the criminals. 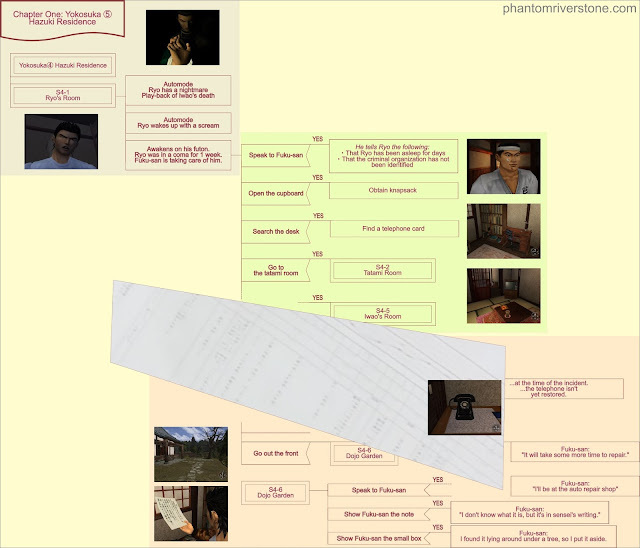 This suggests an implication that in this early design, the police have been investigating the crime, whereas in the actual game this doesn't seem to be the case (Ryo will refuse to dial the police, for example, saying that he wants to avenge his father's murder "on my own"). If Ryo opens the cupboard, he will find his knapsack (backpack) inside. So it would seem Ryo was originally going to be able to carry his backpack around with him from the start of the game! This would make sense given the number of capsule toys and other items he likes to carry around - the game may have imposed an item limit unless you had it, for example - but perhaps it was considered too inelegant and scrapped. In the desk, Ryo finds not a photo or cassette tapes, but a telephone card. Again, this may be something that was removed due to the extra complexity. 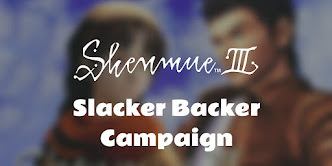 But we can see that the telephone card concept in Shenmue III is in fact a resurrection of an idea originally conceived during the design of the first game. Notably, there is no mention of, or interaction with, the character of Ine-san as there is in the actual game. The last part of the diagram describes some topics that you can talk about with Fuku-san. The third part of the flowchart (click to enlarge). There are some more interesting points in the last section of the diagram. Although the top part of the diagram is obscured, at the right side is a truncated note that refers to the incident and says "...the telephone isn't yet restored". 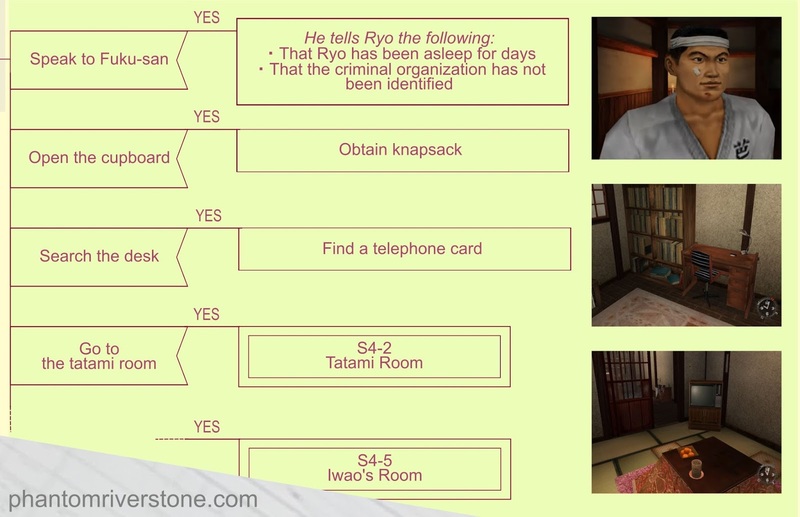 It appears that the original scenario may have been to that the house's telephone is out of order - perhaps from the lightning strike that happened on the day of Iwao's murder - when the game first begins. This would tie nicely into the need for the telephone card seen in the previous part, for Ryo to make calls from a public phone. Slightly further down the diagram, there is a comment from Fuku-san on an unknown topic that "It will take some more time to repair". It would seem likely that he is again talking about the telephone. Following this are some further interactions with Fuku-san in the Dojo garden. Although the topic is not specified, talking to Fuku-san can elicit the answer "I'll be at the auto repair shop". (This is a best-guess translation; grammatically the sentence could equally be translated as "He is in the auto repair shop"). The context of this sentence is a bit of a mystery, especially since no such place exists in the released game. Perhaps this was how Fuku-san was going to earn a living. Next is the option to show Fuku-san a note, to which he replies "I don't know what it is, but it's in sensei's writing". This would imply that Ryo was going to be able to carry Iwao's note with him, whereas in the released game, Ryo places it back on the table after reading it. Finally, there is an option to show Fuku-san a small box. He tells Ryo, "I found it lying under a tree, so I put it aside". Although it's not specified what this small box is, we can make a guess. 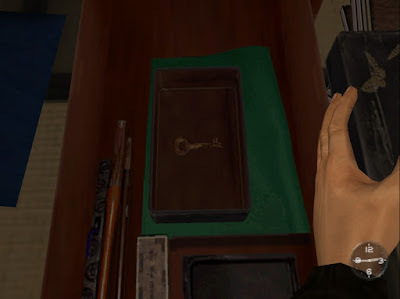 In the released game Ryo finds a small box in Iwao's table drawer that contains a key to open the larger locked box in the Dojo; this eventually leads to Ryo locating the Phoenix mirror. The small box in Iwao's room that contains a key. In this early design, perhaps the box containing the key was instead to be placed in Fuku-san's room, with the story being that he found it outside where presumably either Iwao or even Lan Di's men dropped it. This short diagram snippet reveals some unexpected differences in the scenario compared to the released game, giving us a bonus peek at the game as it was being planned out. I would have loved to have seen even more of this early document! Enjoyed this article? This post was released 7 days early for $2 patrons. If you would like early access to future blog posts & other rewards, support Phantom River Stone through the button below.